Jack Taylor made his fourth century for Gloucestershire in successive matches against Worcestershire to help his side fight back on day two at New Road. After taking the last three wickets to bowl out Worcestershire for 363 in the morning session, Gloucestershire looked at risk of being asked to follow on. But, from 93-5, Taylor and Phil Mustard (29) led a recovery with a stand of 78. Taylor made 101 not out as the visitors were eventually bowled out for 258, before the hosts closed on 10-0. India Test spinner Ravichandran Ashwin took 3-94 in his first spell at New Road, but he was upstaged by Ed Barnard, who took 4-23, including an early burst of three wickets in four overs. 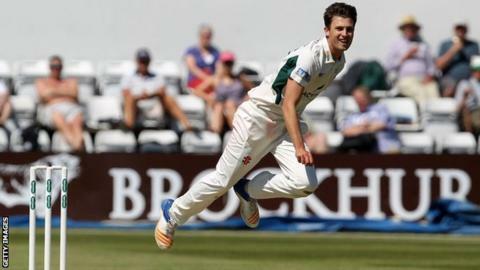 Former England Under-19s all-rounder Barnard, who signed an extended contract with the county on Monday, surpassed the 4-62 he took against Leicestershire last summer, also at New Road. Taylor 25, has only hit six first-class centuries in total. His first was against Derbyshire in May 2015, his highest (156) against Northants six weeks later. The last four have all been against the Pears - the first, 105 at Bristol last season, 143 at Cheltenham last month and now the second of two successive unbeaten centuries at New Road. "Jack Taylor once again played an excellent innings. He really does enjoy batting against us. He has got a world class spinner bowling at him and he coped really well. "Ed Barnard's four-wicket haul was full of effort and skill as well on a flattish wicket for seamers. Both George (Rhodes) and Ashwin bowled well. "It just didn't quite go our way. A couple of nicks were difficult ones and possibly the odd lbw decision. They did well to get past the follow-on. Hopefully the weather is good tomorrow." "It's nice to test yourselves and face guys like Ashwin. I was pretty happy with how I played. It's just one of those coincidences that it's against Worcestershire again. "Turning up here, we thought the wicket was going to do a lot more than it has. It is pretty good, a few balls are starting to go up and down. But it is still quite true. "We've been in this position before where we've taken early wickets and bowled sides out. We did it to Worcestershire here last year."